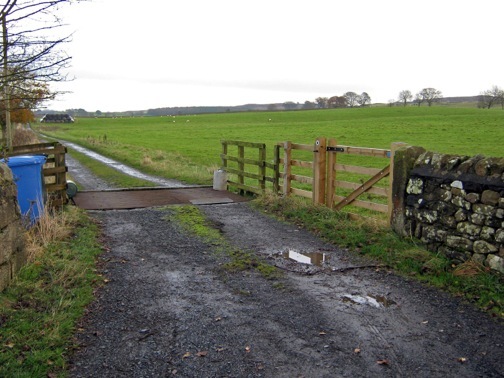 On 14 March 2012, in a useful judgment for path defenders, two high court judges ruled that a cattle-grid cannot be authorised to block the whole width of a footpath or bridleway—Kind v Northumberland County Council  EWHC 603 (Admin). Capheaton bridleway 11, 18 miles north-west of Newcastle upon Tyne, was recorded as a public footpath until 2009 when the designation was amended to bridleway, following the discovery of ‘historical evidence’ about the route, which is said to be an old packhorse road of some importance. At some time, a cattle-grid had been placed across the whole width of the track. Walkers, and later riders and cyclists, were forced off the highway and into a field to avoid the obstruction. In April 2009 Alan Kind, editor of Byway and Bridleway, the Byways and Bridleways Trust journal, and a user of the route, served a statutory notice on Northumberland County Council (NCC) under section 130A of the Highways Act 1980 to remove the obstruction. The council did nothing, so Alan applied to the magistrates’ court for an order requiring the council to remove the grid. The district judge found that the bridleway was obstructed but declined to exercise his discretion to secure the removal of the grid because the bypass was satisfactory for users and an order would have adverse financial consequences on the council. Alan appealed to the crown court on 31 March 2010. Meanwhile, NCC had authorised the cattle-grid under section 147 of the Highways Act 1980, on condition that the bypass remained available for public use. On 9 August 2010 the court held that the grid had been lawfully authorised and therefore one of the necessary conditions for the exercise of the jurisdiction under section 130B had not been satisfied. With backing from the Byways and Bridleways Trust, British Horse Society and Open Spaces Society, Alan appealed to the high court. He was represented by Adrian Pay of New Square Chambers. Since the crown court had exercised its discretion not to make an order, he considered the high court should express its conclusion. He continued: ‘The starting point is the duty imposed on the council as the highway authority by section 130 of the Act to assert and protect the rights of the public to the use and enjoyment of the bridleway and to prevent, as far as possible, its stopping up or obstruction. ..In my view where the obstruction has the effect of stopping up the highway very powerful considerations indeed are required to justify the refusal of an order to take steps to secure its removal. He concluded that the crown court should make the order. Mr Justice King agreed. NCC has decided to discuss with the landowner the widening of the bridleway, to avoid further court hearings. Of course much time and much public money would have been saved if the council had done this when Alan first suggested it. However, this case, along with Herrick v Kidner, provides clear and firm guidance to all highway authorities on the necessity of keeping public paths clear and safe, to their full width. The judgment is a valuable addition to the path campaigner’s armoury. Congratulations to Alan for pursuing this so doggedly to a successful outcome. This entry was posted in British Horse Society, Obstructed path, riding, Uncategorized and tagged Blocked path, bridleway, campaigns, definitive map, Open Spaces Society, Public paths, riding, walking. Bookmark the permalink.